The above isn’t an uncommon public response to modern art that artists have had to endure for decades. Worse, it’s understandable. In an age when many viewers leave the imaginative world of visual art behind in the fifth grade or earlier, painting and sculpture of merit, not to mention new media, has to be recognizable at best or at least merely decorative and non-threatening. The bottom line in this conundrum is that with modern art, as with most things one cannot immediately understand, let alone appreciate, viewers need to have an open mind and be forearmed. Likewise, contemporary art cannot afford to be elitist yet nor should it ever apologize for being creative or pushing the envelope. Artists can’t be expected to explain their work away, yet they can’t afford to assume a viewer will “get it” just because they created it and hung it on some gallery’s wall. Such is the case and opportunity for viewers to appreciate the understated beauty of a new exhibit of abstract art at the Garden of the Zodiac Gallery in the Old Market Passageway. Titled simply John Andrews, it features more than a dozen recent paintings from this Iowa artist that challenge perception and first impressions. To aid in this endeavor while enhancing one’s pleasure, the show’s sponsor, the Moving Gallery traditionally also hangs a press release which helps set the stage. Ignoring it only proves Hodge’s premise. Andrews’ anticipates that response. In a general overview of his current work, the artist says “many people label my work as ‘minimal’ due to its reductive nature. However it is not as ‘cool’ as that historical movement in its use of industrial materials or the content.” Although such modern art movements as Minimalism, Abstract Expressionism, Color Field Painting and even the California Finish Fetish School provide an interesting, if indirect, context for his paintings, he is adamant that his concept is his own. “Aspects” that the viewer may traditionally connect to with even a basic understanding of abstract art. Factor in the absence of figuration or genre such as portraiture or landscape and it becomes clearer that Andrews has something else in mind when he puts brush to paper, panel or aluminum. For him, the content is not only a matter of process, it is the process. Nor can a single work be grasped completely from a single viewpoint. Grouped as they are according to finish, palette and pattern, when seen from a distance it is hard to focus only on one so carefully do they appear to match in tone and texture. For example, the warm, rich hues of #s 11-13 seem to adorn the stunning five-foot-square persimmon #10. Remove or isolate on only one and the bouquet of color falls apart as with a vase of flowers when one is taken, so carefully are they arranged. Yet, move closer, from the alkyd medium to the encaustic #s 11 and 12 and what appears to be similar in finish from a distance is quite unique close-up. With the sublimely beautiful #10, the alkyd layers are so deep and rich, one nearly falls into its high definition color when up close. So too with other alkyd paintings, but the encaustic work can be just as beguiling, as with #s 11 and 12, because though they share a similar color tone, their shiny finishes possess a sturdier, tactile surface as if constructed of metallic fiber. Equally deceptive and enjoyable are figures 5-9 and 14-16 on the left wall of the main gallery continuing into the hallway, all alkyd. Conversely, this cooler variation of the color wheel is both so transparent and deep, what appear to be tiles of solid hues are actually pools of light, reflection and pigment when viewed closer. In this group, the color variations are more nuanced and jewel-like from silver and pearl to turquoise and aquamarine. Less of an impact or interest in the hallway are a group of 25 watercolor “studies” made presumably in anticipation of the larger pieces. As a series, once again, each work differs from the next by virtue of its boxy outline or degree of color wash. As such, though they lack the gemlike patina, polish and sophistication of Andrews’ mature work in this show, one could argue that this exercise serves to accentuate the positive by way of contrast. The exhibit finishes strongly in the back chamber with at least two additional pairings, #19-20 and 21-22. The former pair emphasizes greatly the power and structure of the grid which anchors all Andrews’ work. Like #s11-12, these two resemble remnants of fabric but they possess more of a fragile beauty despite what appears to be the strength of their weave. It represents another nice duplicity in Andrews’ aesthetic, in this case a nice effect in shades of pink and blue and purple and gray. But the exhibit ends on a decidedly more playful and mysterious note with figures 21 and 22. These two pieces flirt with Op Art as their subtle grids create oscillating, optical illusions, referencing digital print-outs and monitor test patterns. 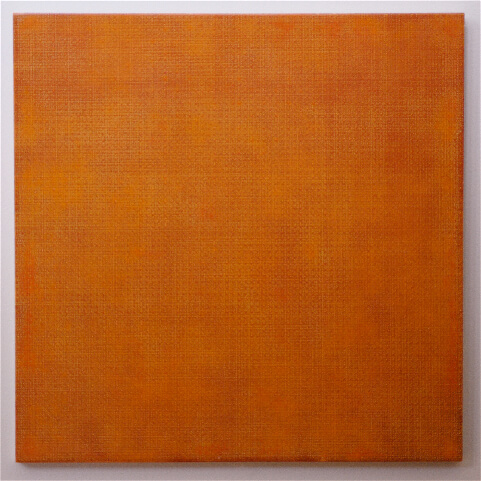 So delicately yet relentlessly do the grids pulsate that the entire painting seems to vibrate in slow, rolling waves. As with other work in this show, Andrews demonstrates that art need not be obvious or a matter of instant gratification to be worthy. An unenlightened or low expectation viewer might react so but chances are his five year old would not.